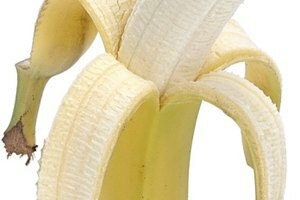 Rich in potassium, vitamin A and B, bananas are a terrific food, both fresh and dried. Bananas are healthy and have medicinal uses as well. 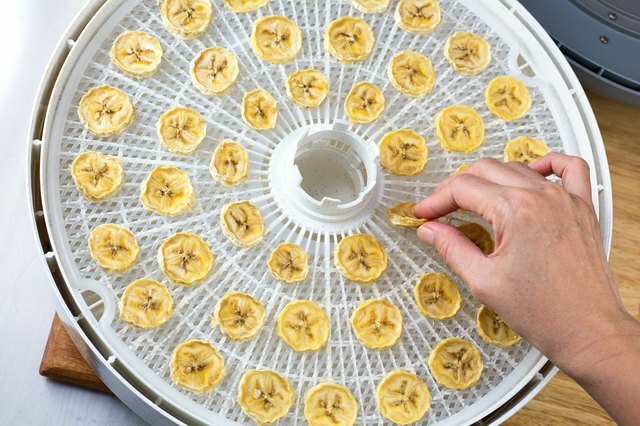 Although bananas can not be dried in the sun as they ferment too quickly, a food dehydrator will easily dry bananas for banana chips. 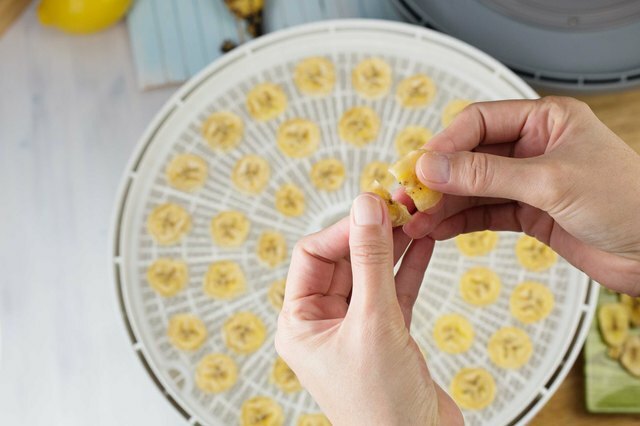 Drying bananas in a dehydrator takes about eight hours, requires no pre-treatment except for dipping in lemon juice, and makes a delicious and healthy snack. Obtain bananas. Slightly brown-flecked bananas will have the sweetest, most concentrated flavor when dried. 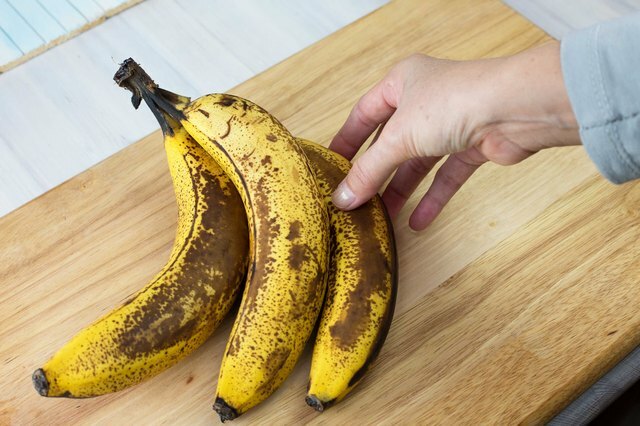 If necessary, wait until bananas have ripened to brown-flecked. Peel the bananas. 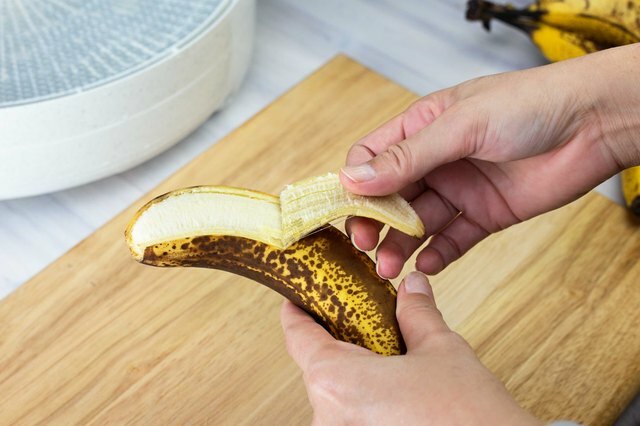 Slice bananas into 1/4-inch or 3/8-inch chips. 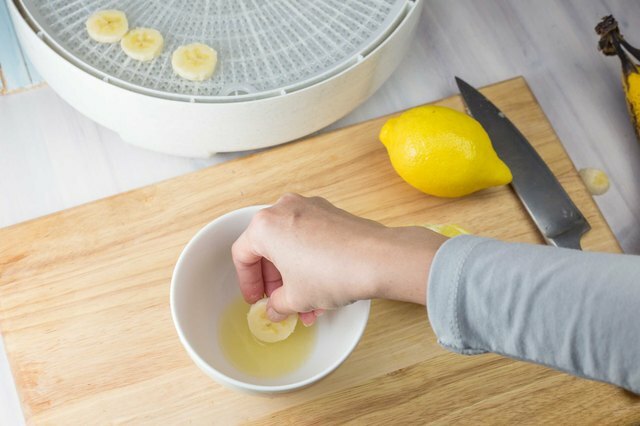 Dip each banana slice into the lemon juice. This lessens browning of the banana chips and adds a bit of vitamin C back into the banana. 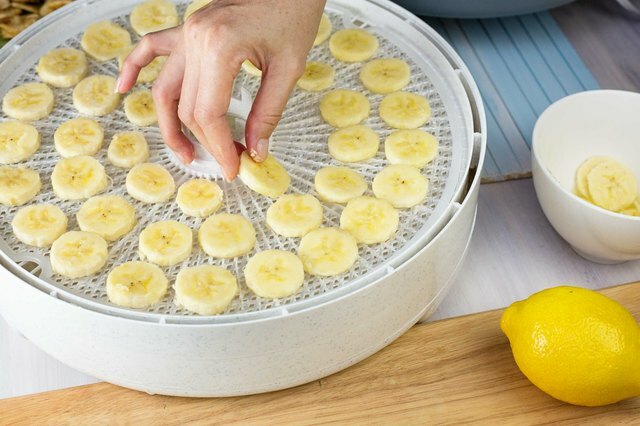 Fill the available dehydrator trays with banana slices. 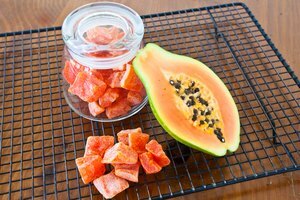 Put the trays into the dehydrator and set initial temperature to 150 degrees Fahrenheit and dry at that temperature for the first two hours. 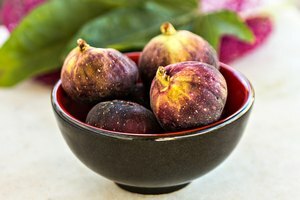 If your dehydrator does not have variable temperatures, just use the normal setting. 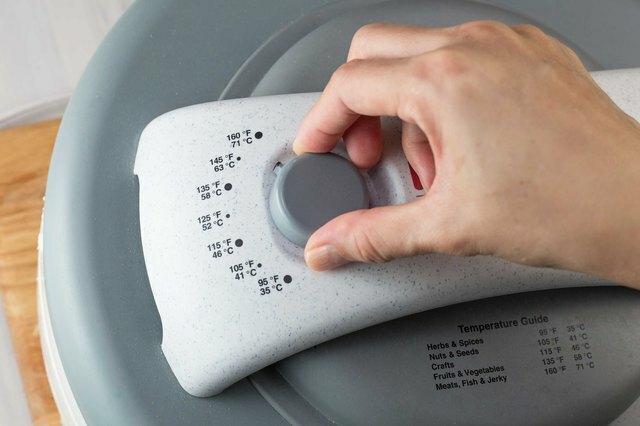 Turn the temperature down to 130 degrees Fahrenheit after two hours. From here it will take another six hours for bananas to fully dry. Half way through, stop the dehydrator and flip over all the banana slices. 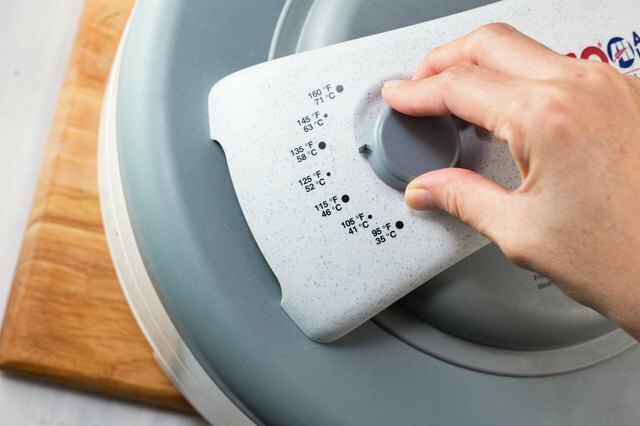 The slices are easy to peel off the dehydrator tray when they are warm, and turning ensures dryness. Test for dryness. If the banana chips are leathery to crisp, they are done. Cool the banana chips for a few hours in the dehydrator before removing them. Pack dried chips into plastic bags when they are fully cool. Store at room temperature. 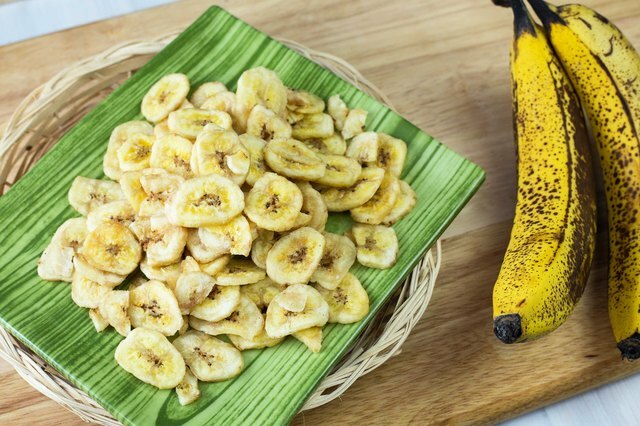 Dip banana slices into chopped nuts or dried coconut flakes prior to drying for additional flavors and textures.